Candygram! 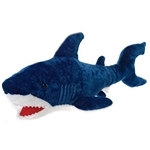 Without you, our stuffed sharks and plush sharks are like sharks out of water. These stuffed great whites, plush hammerheads, stuffed blacktip sharks, and plush tiger sharks need you more than a pilot fish needs a shark. Actually, these stuffed sharks should probably stay sharks out of water. They're not waterproof stuffed animals, you know. A plush shark is made to swim in the oceans of your imagination and we all know how deep those can get. There is no limit to the depths that you and your stuffed shark can travel and no end to the adventures that will call your name. You can fill your plush aquarium with all types of stuffed sharks and plush sharks here at Stuffed Safari, so put on your wet suit, grab your flippers, and dive in! Land Shark!